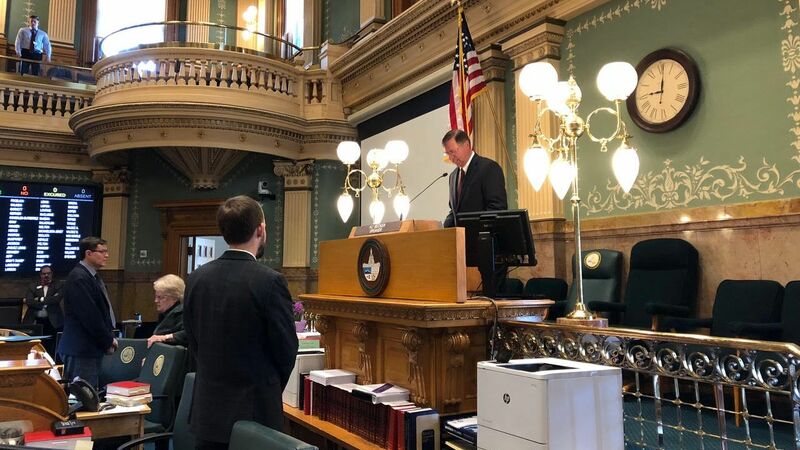 At the invitation of Matt Soper, Colorado Representative from Delta County and member of the Delta Church, Eric Nelson, RMC’s VP for Administration, arrived on the morning of March 27 at the Capitol Building in Denver to offer prayer for the House of Representatives, a common practice at the beginning of each session. At least half a dozen representatives of the 65-member body expressed their thanks for Nelson’s prayer, which requested God’s presence in this diverse body of representatives, saying, “while there may be sharp differences in ideology and points of interest, may You help all to recognize that the end decisions will be stronger because of these differences. Nelson was warmly greeted at the door of the House Services Committee chamber by the Sergeant-at-Arms and directed to his seat. Having been previously coached in House protocol regarding the length (one to two minutes or less) and content (be mindful toward the diversity of all the members of the House and citizens of our state) of his comments, Nelson came prepared with a written prayer that would be included in a book of prayers created by the House every few years. Encouraged to bring “a guest or two” and told that “cameras are welcome,” Nelson came with his wife, Jerene, and grandson Ben, a fourth grader at HMS Richards School, where his class is currently studying government.